I heard Sheila Hicks speak at Whitechapel Gallery last autumn and realised that although I was familiar with her name I was unfamiliar with her work, I had seen images of her giant installations and am familiar with the small weavings contained in the truly beautiful book ‘Weaving as Metaphor’ but had never actually seen any of her work in the gallery. The Hayward’s exhibition is small, but also a delight. A small collection of weavings, some larger wrapped pieces, two panels of stitched discs that refer to the tapestry made (and re-made) for the Ford Foundation and the sumptuousness of simple, oversized hanks of thread stitched to canvas playing with colour. 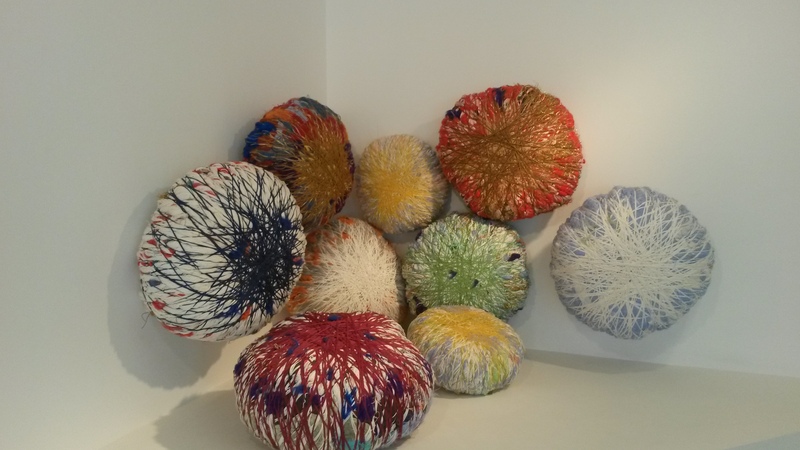 I particularly liked the wrapped Nomad Treasure Bales for their juxtaposition of solidity and ephemerality. The layering of the binding suggests an alternative arrangement of the woven grid, but one that lacks the integration and strength of weaving, if loosened the structure, so apparently firm and solid, would fall apart. 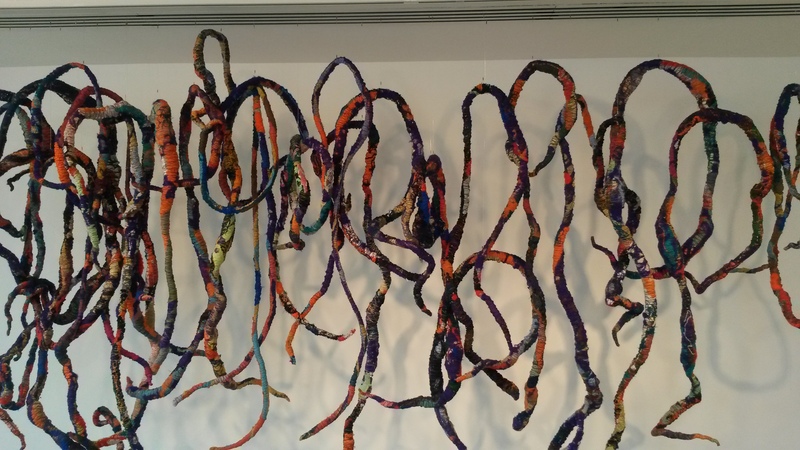 Another large scale piece, Baôli Chords/Cordes Sauvages Pow Wow reminded me of Eva Hesse’s rope works. I loved the way they snaked, simultaneously animated yet static, across the space, the colour and fibre contorted and constrained by the tight binding. A small but interesting collection. I would have liked to have seen more. 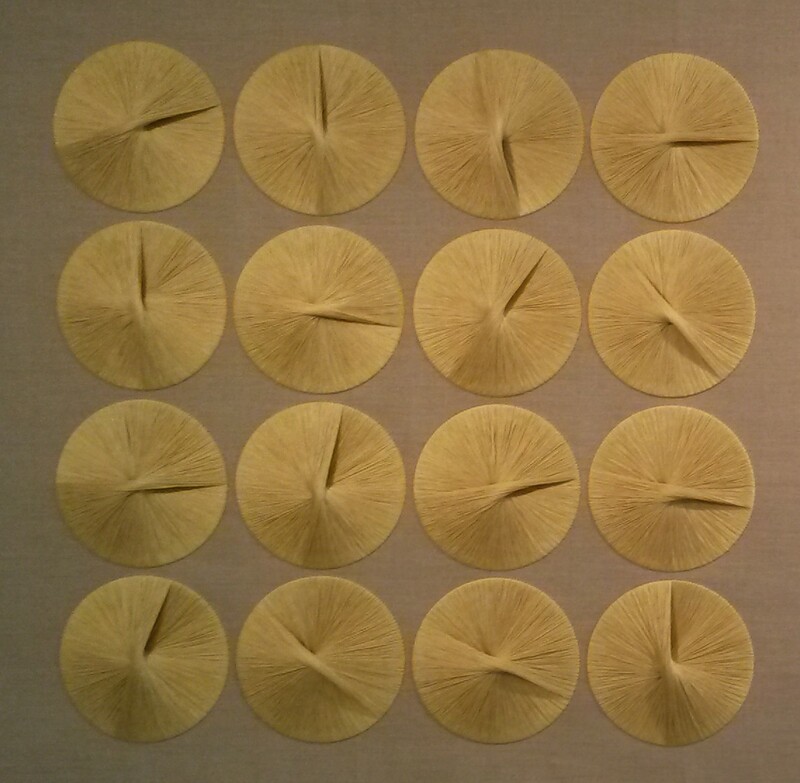 This entry was posted in Exhibitions, Uncategorized and tagged Sheila Hicks. Bookmark the permalink.